As the seasons change, trees often get damaged or knocked down by storms. As the seasons change, trees often get damaged or knocked down by storms. When this happens, emergency tree removal can be key to keeping your home safe and sound. All sorts of things can lead to you needing this service, which can often even be preventative and help you avoid expensive damage. If you are wondering if you need emergency tree removal, read on to learn about your options and why this can happen. Rain and wind can knock trees loose and onto buildings, powerlines, your driveway, and other parts of your home and property. 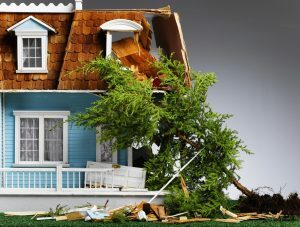 If you notice a tree has been damaged or partially overturned but has not fallen yet, it is important to address it as quickly as possible, before it can fall and cause damage. After big storms it is important to inspect your trees for damaged limbs and overturned roots. This way, if there are any problems they can be addressed quickly. It’s better to remove a weak tree or risky limbs before they can wreck your fence, break your window, or cause other problems. Tree disease can often necessitate emergency tree removal. Soil erosion and disease can have some nasty effects on trees. If tree disease goes undetected for a long time it can hollow out a tree, making it weak and brittle and likely to fall. It can spread and damage trees from the tips of their leaves to their vast root network. If you did not catch tree diseases in time, your tree may need to be removed. If tree disease has gone unchecked for a long time, it can spread to a vast number of trees. If tree diseases are caught early enough, most of them are easily treatable. As with many sicknesses, early detection and treatment is the key to keeping your trees well. Call Nelson Tree Specialist for Emergency Tree Removal. This entry was posted on Friday, August 4th, 2017 at 3:40 pm. Both comments and pings are currently closed.